Casa Lever, New York. Casa Lever is a fine dining restaurant in Manhattan which displays modern art. 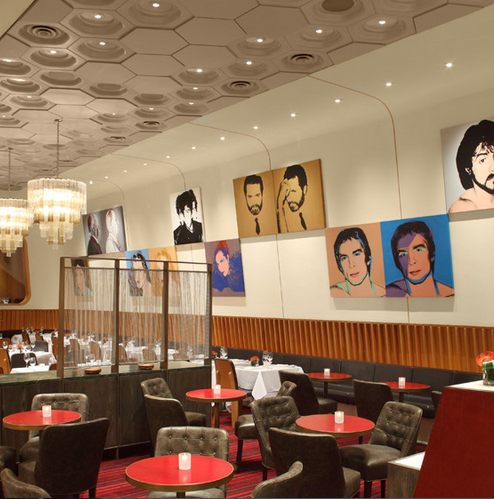 Several portraits of celebrities created by Andy Warhol grace the walls of this restaurant. The portraits include Sylvester Stallone, Aretha Franklin, and Giorgio Armani. Four Seasons Restaurant, New York. Four Seasons Restaurant displays changing galleries of Modern Art, including artworks from Andy Warhol, Jackson Pollock, and Helen Frankenthaler. There’s an interesting story about American artist Mark Rothko. Rothko was commissioned to create a series paintings for the dining rooms. He created the paintings with “malicious intentions” but then decided to return the advance payment and kept his paintings for himself. The Leopard at des Artistes, New York. The Leopard is an Italian fine dining restaurant in New York. The dining area displays the six panels of wood nypmhs and paintings by American artist Howard Chandler Christy which includes The Parrot Girl, The Swing Girl, and Fountain of Youth. Tru, Chicago. The interiors of Tru looks like an art gallery, with its high ceilings, pin-spot lights, and white walls. It displays pieces from some of the best 20th century artists such as the King of the Pop Artists Andy Warhol, American geometric painter Peter Halley, and German abstract painter Gerhard Richter. L’Escargot, London. Opened in 1927, L’Escargot houses an extensive collection of original artworks by some of the famous artists in the 20th century such as French painter Henri Matisse, English painter David Hockney, Spanish painter & sculptor Joan Miró, and Russian artist Marc Chagall. Maxim’s, Paris. Maxim’s is famous for its Art Nouveau interior decor. It displays an extensive collection of illustrious masterpieces from the Belle Epoch. Maxim’s display more than 500 original, signed pieces from all over the world. La Colombe d’Or, St. Paul de Vence, France. La Colombe d’Or is a hotel and restaurant located in an old medieval town in France. Paul Roux started it as a café bar in 1920 and then later opened an inn which attracted artists from neighbor towns. 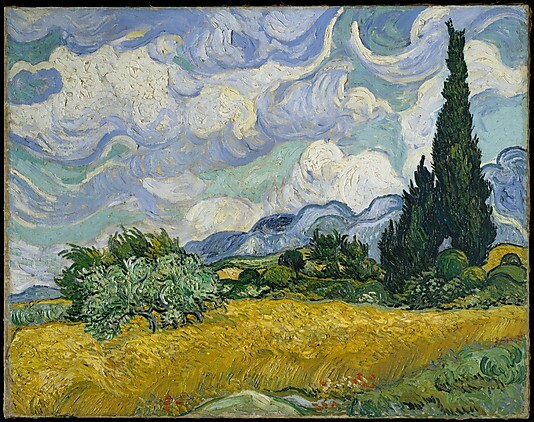 Many paintings now grace the walls of the restaurant since artists such as Pablo Picasso and Henri Matisse who were frequent customers exchanged their works as payment for meals or their stay. Dab an old #12 Serie 7 Winsor & Newton round red sable on a paint color and start by laying the full brush on the paper and lifting away cleanly. Try more short dabbing strokes across your paper. Rinse your brush and change colors. Keep your brush strokes uniform in width as you start to overlap strokes to develop shapes. 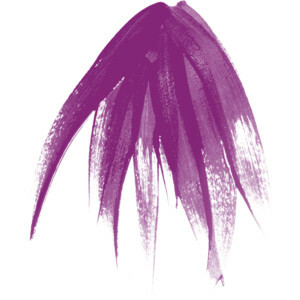 Play with different groupings of brush strokes across your paper. Use as many color as you please. Continue laying down similar brush strokes trying different angles of attack. Allow your wet brush strokes to intermingle as you progress. Start by dipping your brush into a color you want and gently poke or stab your brush into the paper. The effect that you want to see after doing this is to see a fanning pattern of the hairs as you push it into the paper. 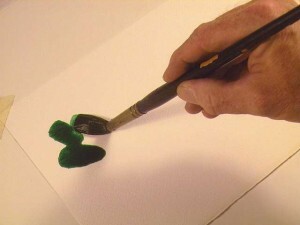 Continue doing this on your paper, adding some twist or spin to your stroke by rolling your brush in your fingers as you paint. Experiment with angles of attack to find the best spreading point for the brush you are using. Consciously try to shape the hairs as you press a stroke into the paper. Give it a little wiggle while the brush hairs rest on the paper to make them align. Rinse and switch colors and/or brushes. 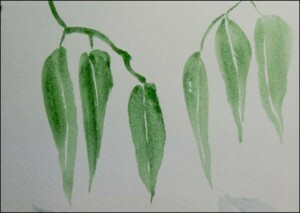 Continue to practice spreading and twisting your brush, building texture across the paper. Look for organic shapes and textures as you allow your strokes and colors to overlap and blend. 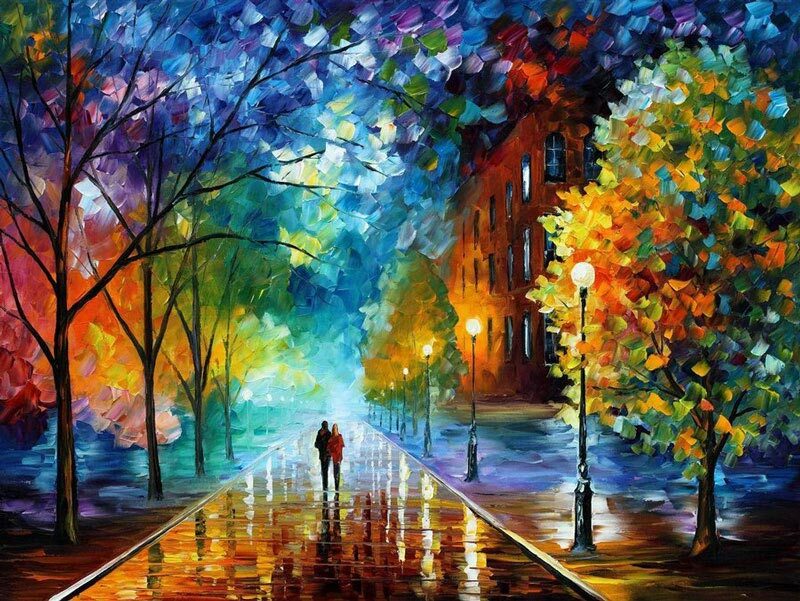 This is another example of a what is considered a painterly stroke. “Cutting an edge” is a sign painter’s term for pulling a clean line of paint with your brush. A clean line being a line that is smooth and flowing with no irregularities. Consider each shape before you start to paint. You may lightly doodle the shapes first before painting. A round #8 Grumbacher Watercolor Classic red sable brush can be used in larger shapes a round #4 Kolonok 1001 Series Kolinsky sable for smaller shapes. If your brush is too full to get a proper point, touch it on a sponge, tissue, or towel to remove excess paint before you start. 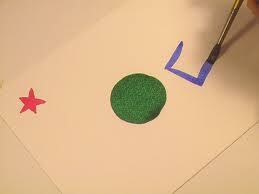 While you have one color in your brush try painting all the different shapes across the page in that one color. Rinse your brush out, switch colors, and repeat. 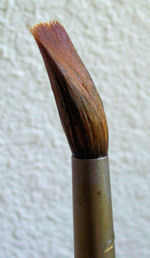 For sharp corners use the very tip of your brush and start the brush stroke at the corner point of the shape. For circular shapes, start your curving brush stroke inside the edge of the shape and pull the stroke into position before continuing the stroke. Switch to a smaller brush and try some mini shapes. What kind of painting do I always do? What medium am I using? What is my budget for an easel? Where will I place and store the easel? Do I have adequate space? Where do I usually do my paintings? Inside a studio or outdoors? Your answers to these questions will help you decide on which easel is best for you. A tabletop easel is best if you like to paint small-scale paintings or you have very limited space in your room. Different medium require different easels. For example, if you paint with oils, use an A-frame or H-frame easel, or whatever easel that will provide you with a vertical working surface. If you use several medium such as oils and watercolors, a convertible easel is best. Aside from these factors, the budget and space should also be considered. Tip #2. Check the sturdiness of the easel. 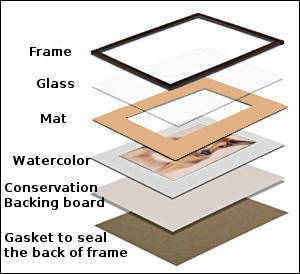 The easel should be sturdy enough to hold your canvas, support the painting process, and will not easily topple. The larger the canvas you’re working on, the sturdier the easel should be. You wouldn’t want to work on a shaky surface wherein each brush strokes vibrate because the easel cannot give ample support. Make sure that you’re not buying a display easel which is lightweight and spindly. It is designed for showcasing paintings, and not for working on paintings. Tip #3. Choose an easel that offers adjustability. Buy an easel which provides the greatest degree of adjustability. When painting, you may want to paint standing up or sitting down, you need to work on top of the canvas as well as at the bottom. You need to have an easel that can be adjusted to give you the right tilt so you can paint on different areas of the canvas. Tip #4. 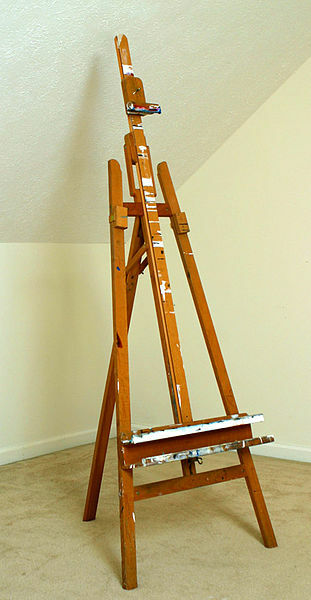 Look for an easy-to-use easel. This tip is related to Tip #3. Check if you can easily use the screw and bolt mechanism of the easel. See if it tightens properly according to the height and angle you preferred. Tip #5. Save money for a quality easel. Keep in mind that an easel is one of your biggest expense in painting. 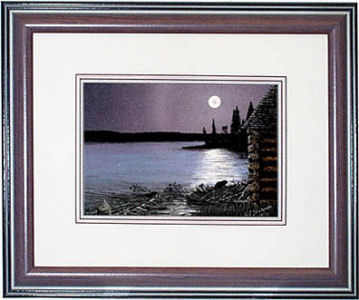 You may have to wait for some time and keep saving for a high quality easel rather than buying cheap easels. You will be using an easel for a long time so it’s better to buy an easel that would last. Watercolor is one of the most versatile mediums to work with that you can paint your subjects from very controlled and detailed, to very loose and impressionistic. It is exciting and enjoyable but challenging and a bit frustrating at the same time. Now that you’ve decided that you want to try watercolor as a medium, you need to start somewhere and that is to know your materials. 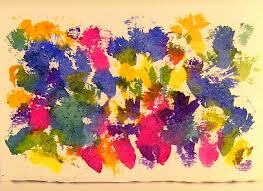 Watercolor paint consists of four principal ingredients: pigments, gum Arabic, additives and solvent. The term watercolor refers to paints that use water soluble, complex carbohydrates as a binder. 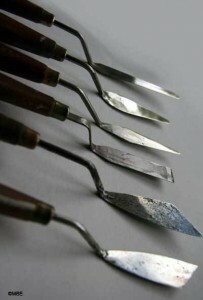 Originally (16th to 18th centuries), watercolor binders were sugars and/or hide glues, but since the 19th century the preferred binder is natural gum arabic, with glycerin and/or honey as additives to improve plasticity and dissolvability of the binder, and with other chemicals added to improve product shelf life. Cake and Pan watercolor sets usually have built-in fold out palettes that are useable in varying degrees depending on their size and orientation. For your tube watercolors you can use a flat white dinner plate or buy some inexpensive 6 or more welled plastic palettes like the ones you used in grade school for your tempera paints. A covered plastic palette makes for the least waste and most convenience if you are using tube watercolors. If you are getting serious, buy one. A #8 round red sable watercolor brush is the best beginner brush to buy most especially when you can afford only one brush. Adding a round #4 and a 1″ flat would come in handy for detail work and large washes. Most manufacturers have starter sets that contain very usable equivalents. Some minor extra things that you will need in you watercolour kit is a pencil, a kneaded eraser, some tissues, and an old towel or paper towels, and a couple of large metal clips for holding your watercolor paper to a board.